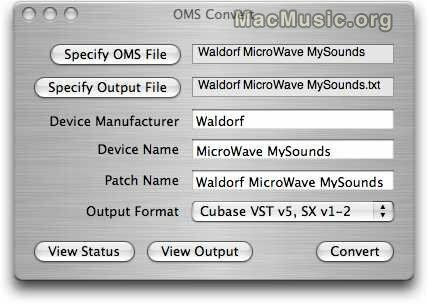 If you're a Cubase user and want to move from Mac OS 9 to Mac OS X, OMS Convert will help you ! This utility allows you to convert OMS Patch Name files into Cubase SX 1.0x and 2.x format. OMS Convert is free downoadable beta version. OMS Convert Post a comment ? 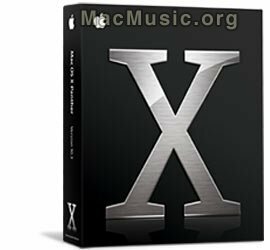 The 10.3.2 Update delivers enhanced functionality and improved reliability for Mac OS X v10.3 "Panther" and is recommended for all users. For detailed information on this Update Post a comment ? Laurent Colson releases MusicMath 2.21, now OSX compatible. Music Math is a freeware which converts music values (BPM, semi-tones, samples, ms, Hz, Timestretch %). You can calculate the time stretching to use on a sample if you change the tempo, or the number of semi-tone to transpose, the time stretching to apply if you transpose a sample and you don't want to change the duration, the delay in ms to synchronise with BPM. It also include a tap delay function and a BPM/sample converter. - Tempo : computes the equivalent TimeStrecthing from the original and new tempos. - Delay : convert tempo to musical duration (ms) or equivalent frequencies (Hz), ie for LFOs rates. - Samples : convert samples duration (in samples) to tempo or tempo to sample duration. 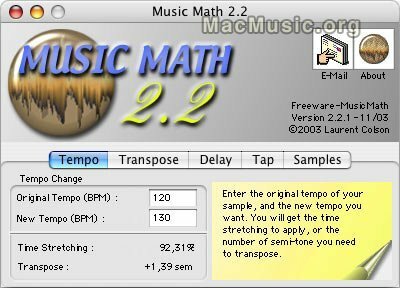 Download MusicMath 2.21 OSX (OS9 version also available) Post a comment ? Gmedia Music annouces the impOSCar. This plug-in instrument is based on the original UK designed OSCar synthesiser, released in 1984 and which subsequently became a favourite instrument of Ultravox, S-express, Jean Michel Jarre and Underworld. This plugin version adds new features such as polyphony, improved UserWave editing, enhanced filter modes, synchronised LFO and increased LFO waveforms, delay and chorus effects. Demo for the impOSCar for VST and Audio Unit on Mac OSX are available on download. Elemental Audio Systems announced the release of version 1.2 of its audio analysis plug-in, Inspector. The new version adds Digidesign RTAS support, an enhanced user interface design, automation support, and new spectral display modes. Now, Digidesign Pro Tools users can use Inspector's alarms to be notified of adverse conditions in their audio. 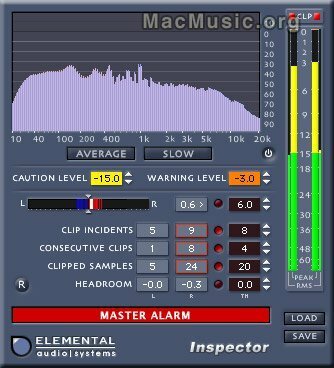 Inspector is available as a FREE download and supports the RTAS, Audio Unit and VSTplug-in formats on Mac OS X. Inspector 1.2 Post a comment ?